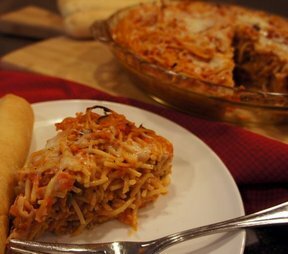 This recipe is a great way to utilize leftovers in your refrigerator. If using leftover cooked spaghetti, use about 3 1/2 cups. Use other veggies you might have, including broccoli florets or cooked cubed potatoes. 1. Preheat oven to 350Â°F. Cook spaghetti as directed on package. Drain well. 2. Meanwhile, heat oil in large ovenproof skillet on medium-high heat. Add mushrooms, bell pepper and onion; cook and stir 5 minutes or until tender. Add zucchini, tomatoes, rosemary, garlic powder, oregano, thyme and salt; cook and stir 10 minutes until most of the liquid has evaporated. 3. Beat eggs in large bowl. 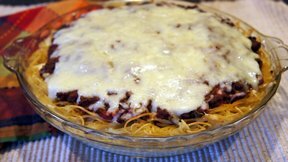 Add spaghetti and 1 cup of the cheese; mix well. Stir into vegetables in skillet. Cook on medium-low heat 5 minutes or until bottom is set. Sprinkle with remaining 1 cup cheese. 4. Bake 8 to 10 minutes or until center is just set and cheese is melted. Cut into 8 wedges to serve.